Just after 11 am on Saturday morning, I became the proud parent of my very first Tamagotchi, freshly hatched from its virtual egg. By yesterday afternoon it was dead; its passing a poignant reminder that the gadgets we adored as kids aren’t always as awesome 20 years later when we’re grownups. 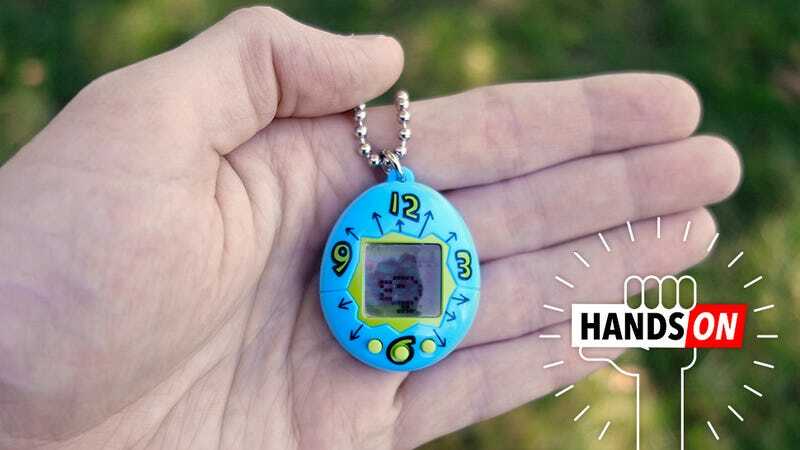 To commemorate the 20th anniversary of one of the world’s first virtual pets, Bandai is re-releasing the Tamagotchi, which, two decades ago, flew off shelves faster than Nintendo’s miniature SNES does today. Like the Super Nintendo Classic Edition, the reborn Tamagotchi is yet another attempt by companies hoping to milk a few more dollars from a once-popular product by cashing in on nostalgia. If you can remember begging your parents for a Tamagotchi of your own 20 years ago, you’re probably now in a place where $15 is a small price to pay to scratch a nostalgic itch. The problem is that nostalgia and electronics aren’t always a match made in heaven. When I was a kid, playing Super Nintendo was an amazing experience because, at the time, it was the cutting edge of gaming consoles. But today, only a couple of titles on the SNES Classic Edition can hold my attention for more than a few minutes. The new Tamagotchi is, disappointingly, even less engaging. There are six different shell designs to choose from, but the new Tamagotchi’s guts are all the same. Based on the original version of the toy released in Japan in 1997, the new Tamagotchi features the same Japanese shell designs that were hard to find in North America. The virtual pet has now been made even smaller and easier to pocket, but decades of electronic miniaturization is unfortunately the only technological improvement the resurrected Tamagotchi takes advantage of. The Tamagotchi’s low-res screen is cute, but hindered by a reflective cover on the screen that reflects everything. The new version of the toy features the same low-resolution LCD display as the original, with a mere 256 pixels used to display your virtual pet and various icons that represent its health, living conditions, and a handful of different ways you can interact with it. It would be charming, in a retro kind of way, were it not covered by a clear, curved plastic shell that reflects light better than a mirror, creating a perpetual glare that makes the LCD almost impossible to see. I had to constantly reposition the toy to see what was happening on screen—usually unsuccessfully—and using it in a dark room isn’t a solution either, because there’s no backlight. Touchscreens? Nope, caring for your Tamagotchi is still done using three simple buttons. As with the original, interacting with the new mini Tamagotchi is done through three unlabeled buttons that perform multiple tasks depending on the status of your virtual pet. Had I been younger 20 years ago and actually owned a Tamagotchi at the peak of their popularity, I’m almost certain I would have remembered what each of these three buttons did. But I didn’t, and as a result I found myself having to constantly reference the included manual during my brief attempt at parenting this weekend. The survival of a Tamagotchi still relies on constant interaction with its owner, who’s responsible for feeding, cleaning, and caring for the creature’s many needs. And over just a couple of days I’ve come to realize these digital creatures have little chance for survival in 2017. There are just too many other digital distractions in our lives they have to try to compete with. Instagram, Twitter, Snapchat, video games, Netflix, YouTube, and books are just a small sampling of the entertainment that’s instantly served up by the smartphone that’s never more than a few feet away from me. What made matters even worse for my Tamagotchi’s slim chances of survival is that these other modern digital distractions are also routinely sending notifications to my smartphone and smartwatch. The occasional quiet beeps the Tamagotchi made to notify me when too much virtual poop had piled up were completely drowned out. Without the ability to ping my smartwatch with a notification, my Tamagotchi didn’t stand a chance. I wanted to be a diligent Tamagotchi parent, I really did. I missed the fad the first time around and was genuinely excited to get caught up in caring for my virtual pet like millions of kids did 20 years ago. But I failed… and it died. Was I a negligent parent? The courts might rule as such, but I’ve since absolved myself of any guilt. After 20 years the original Tamagotchi hasn’t evolved any kind of mechanism to keep me interested for more than a few minutes. Were my virtual pet able to ping my smartwatch or phone when it was time to shovel virtual poop, it might still be alive right now. Maybe nostalgia isn't so awesome?